What is the contact angle? Wetting can be defined as a phenomenon where a solid / liquid interface is formed when two phases (a solid and a liquid) are in contact with each other. 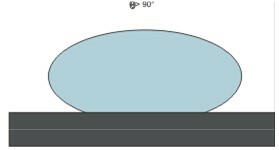 The wetting is characterized by a contact angle, which shows more or less the spreading of the droplet. The contact angle is defined by the interface (P) on the surface of the drop at point (A). (A) is a triple point, w.o.w. viagra sans ordonnance belonging to the common curve of both gas, liquid and solid. This angle is measured at the inside of the liquid (see fig) The contact angle is between 0 ° and 180 °.